This is one of my favorite meals! Well, it is now anyway. I love sticky rice, but you can use regular white rice if you don’t have a rice cooker. If you can make the sticky rice a day or two ahead of time, it will be better. I wrote this recipe to serve 3-4 people. Let the rice soak in the water for 40 minutes-2 hours in a rice cooker, then turn the rice cooker on. When it’s done let it sit in the rice cooker for about an hour with the heat turned off. Put it in some tupperware with a lid and stick it in the fridge to heat it up later if you can wait. Heat the oven to 425 degrees. When it’s heated up, place the fries on a pan and cook for 26 minutes. Form the beef into 3 or 4 patties and cook them all the way through. We cook ours using our panini press, but using a pan works too. As soon as you take them off the grill or pan or whatever, put the cheese on top. 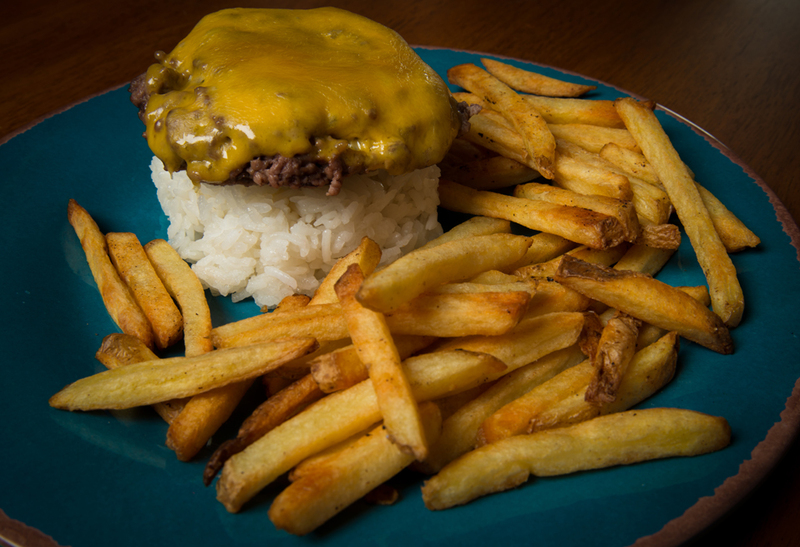 Form the sticky rice into round patties for your burgers to sit on, surround with fries and eat! This entry was posted in Recipes and tagged beef, elimination diet, french fries, fructose, fructose malabsorption, gluten free, rice, sticky rice by nosugarlessgum. Bookmark the permalink.